When a hard drive goes bad, the first thing you'll probably do is have a good old curse at the platter gods for picking on you. You then might decide to have a bit of a panic when you realise that you didn't back up your files. Shortly after sweating out a few pounds, you'll probably have a go at fixing it. Well, it's worth a shot after all. But chances are, unless you know exactly what the problem is and have the skills necessary to fix it, you're pretty much up poop alley. If you're lucky and the disk head or motor hasn't been damaged, the problem could lie in the controller board or printed circuit board (PCB). Often, when there's a power surge or the drive overheats, it can damage the board. If this happens, then you can quite easily replace the PCB with one that is working and bring your hard drive back to life. A common sign that a PCB has been in the wars is a scorch mark, but sometimes there are no visual cues to give the game away. The PCB might not be the problem after all, then, but it's the one area of the drive that you should tackle first when something goes wrong. 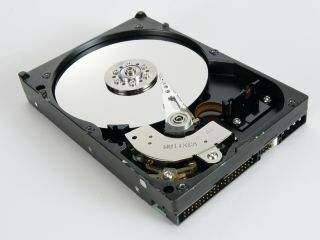 After all, a replacement PCB from a specialist like www.hdd-parts.com will set you back around £25 delivered to your door, so it's a relatively inexpensive way of fixing your drive. If you were feeling plucky, you could just go to a data specialist and get a man in a white coat in a lab to carefully take your entire hard drive apart and put it all back together, in the hope of rescuing your drive, but you'll be looking at a bill for at least £1,000. Unless you really, really need the files on that drive, you'll avoid this route and go down the PCB road first. Does it really work? Well, we tried it on a drive that had suddenly stopped working one day. There were no horrible clicking sounds, it simply wouldn't power on – the thing was lifeless. So, we replaced the PCB with an identical working one and managed to get it working again. This wasn't after trying it on many different drives – this was the first one we'd worked on, so it wasn't a fluke. It's worth mentioning that if this works for you, and there's a pretty good chance that it will, once it's up and running again, don't get lazy and put it back in your PC. If it failed once, there's a probability that it will fail again. Our advice is to transfer all your sacred files to another drive and then bin it… or pop it in the trophy cabinet.